The austere towers and battlements of 12th-century Gothic Loket Castle stands on a granite headland over a bend in the River Ohře and dominates the Western Bohemian town of Loket close to the peat bogs, pine trees and birch forests of the Slavkov Forest Protected Landscape Area. Originally built as a defensive fortress to protect trade routes from Prague, the castle became the favorite royal retreat of King Charles IV of Bohemia, who came here in the mid 14th century to enjoy hunting in the surrounding forests. Later in its life, Loket was occupied by several noble Czech families and between 1822 and 1948 was used as a prison. Today tours of its imposing interior include the torture chambers in the dungeons, where some extremely graphic instruments of torture can be spotted. In the course of the 19th century, the town of Loket became known for its porcelain factories and today the castle displays a porcelain collection of exceptional quality, including Art Deco vases and rare spa cups used when taking the waters at neighboring Karlovy Vary. Other exhibitions dotted around its maze of rooms, cellars and dungeons include archaeological finds from the area and fine, faded pastoral frescoes in the first-floor galleries. A small armory occupies sections of the Romanesque tower, where according to legend a friendly dragon has lurked for centuries. Zámecká 67, Loket. Opening hours daily Nov–Mar 9am–4pm; Apr–June, Sept–Oct 9am–5pm; Jul–Aug 9am–6.30pm. Admission adults CZK 150; seniors, students and under 18s CZK 125; family ticket CZK 380. 14 km (8.75 miles) west of Karlovy Vary and best accessed by bus No 6. If coming from Prague by car, take the E48 motorway towards Cheb; the drive is just under two hours. Explore spas and castles on this informative and entertaining 10-hour day trip from Prague to Karlovy Vary and the medieval Loket Castle. 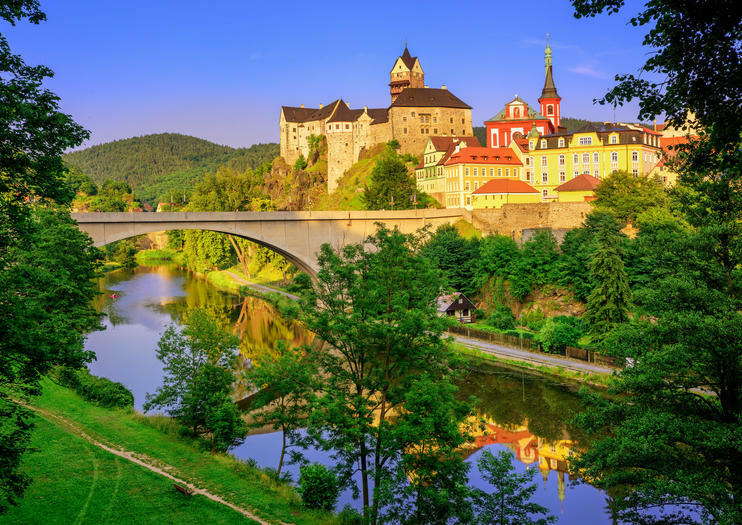 With your private guide by your side, stroll around pleasant Karlovy Vary (known as Carlsbad in German) and then visit bewitching Loket Castle before stopping by the famed Moser Glassworks. Karlovy Vary and Loket castle is natural combination as the castle is not very far from the city.Karlovy Vary is globally known spa town frequented by tourists for almost 200 years. You probably heard about its mineral springs you can taste for free in a city centre and about her famous colonnade. Karlovy Vary is also a center of film festival every summer.Loket castle stands strong since the 13th century and even though it was renovated many times, it still keeps its medieval form. You will have an opportunity to see both its exterior and interior. Our full-day trip starts in Prague in the morning hours. After a journey of about two hours in a comfortable minibus with we will arrive in Karlovy Vary, one of the most visited Czech spa towns, founded as early as 1370 by the Czech emperor Charles IV. Together we will visit the town centre, with its amazing spa buildings and the most powerful spring, Vřídlo, and also the museum of the Moser Glassworks, one of the most famous glass manufacturers in Europe, founded in 1857.After a three-course tasting lunch in a charming restaurant we will move on to the town and castle of Loket nad Ohří, a stunning little mediaeval place. Our next stop will be something special. Have you ever heard about the reliquary of St. Maurus? This amazing religious artefact is exhibited in Bečov Castle, and after the Czech coronation jewels is the second most important historical item in the Czech Republic and after the Czech coronation jewels is the second most important historical item in the Czechia.